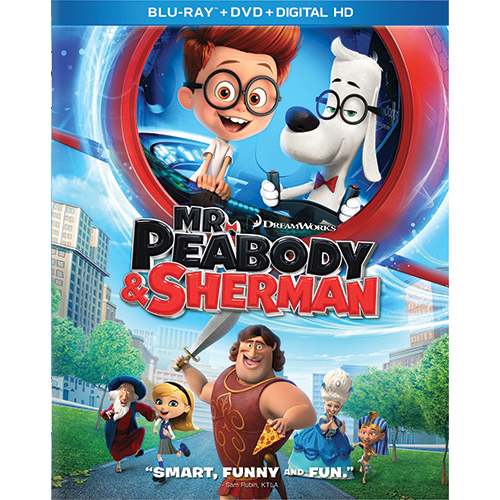 Some of Mr. Peabody’s parenting lessons come via decidedly non-traditional child-rearing methods – like taking Sherman in a series of incredible adventures traveling across time. Time travel is a compelling notion that lends an intriguing dimension to an exciting, adventure-filled story. The film’s contemporary characters interact with equally entertaining famous figures from history – a dynamic that provides surprising fish out of water moments and myriad culture clashes. Journeying across the eras also offers a host of rules that must be followed – like never meeting yourself and having as little impact on the past as possible. Mr. Peabody and Sherman’s entrée to the infinite folds of history is a wondrous contraption called the WABAC, which is the singular creation of the world’s greatest inventor, Mr. Peabody. The perspicacious pooch built the device so Sherman could experience history up close and personal. The WABAC is much more than a vehicle; it’s character in its own right, which becomes an integral player in Peabody and Sherman’s adventures through time. I had heard of this movie and it did sound interesting so I couldn't wait to watch it. I watched it on the weekend and I absolutely loved this movie. It is very well written, the graphics are fantastic and I think people from all ages will love this one. It is fun and funny and I is great for family movie nights. If you want to purchase this movie, it is now available in stores.